Peter Gold, voted best of Portland for 2014 in The Portland Monthly Magazine, practices massage to help his clients relax and feel better in their bodies. Using his daily Qigong practice as the foundation for his massage practice, Peter translates the energy cultivated through Qigong into a healing massage in tune with what energy the body needs. Peter incorporates a variety of massage techniques into his practice, including Swedish, deep tissue, Shiatsu (rhythmic acupressure), and cranial sacral. Choosing a Path: Peter’s journey with massage started in Asia in 1999. At the end of a four-month trip to Thailand, he asked himself the age-old question, “where do I go from here?” Peter had been working as a ski instructor, and while he had loved that work, he felt it was time to move on. He liked massages, and believed he would enjoy being a massage therapist and would be good at it. It turns out he was right. Peter it seemed had a gift for massage. Getting There: Peter Gold learned the practice of massage in Santa Fe, New Mexico. He had arrived in New Mexico originally to be a ski instructor at Taos. Peter grew up in Chicago, and learned to ski at Wilmot Mountain in Wisconsin, as well as during family trips to the Rockies. When he was 11, he started going to ski camp at Timberline on Mt. Hood, and enjoyed three summers of skiing with the big name skiers training during the summer. Apres Ski: The summer after college, Peter went back to Timberline to be a counselor at the ski camp. One of the ski coaches at Mt Hood was also an instructor at Taos, and connected Peter with the ski school there. As it turned out, this same coach/instructor was also a massage therapist. Peter attended the same massage therapy school in Santa Fe. Peter and Qigong: Peter also discovered Qigong during this time, and he connected with a Qigong teacher and mentor from Taos. Qigong has been central to Peter’s life and his life’s work for the past 15 years, practicing it 2 – 3 hours daily. He describes it as a practice of balancing and cultivating one’s energy that translates into a more vibrant experience. Through Qigong, Peter is able to control his energy flow, sensing when and how much energy to use during a massage, depending on what the body needs at that given point in time. Finding Portland: Not wanting to lose his Qigong mentor when he left New Mexico, Peter followed him up here to Portland sometime around 2006. By this time, Peter had also started another pursuit. He was attending graduate school to get a PhD in counseling. Fortunately for Peter, he had settled on a program in Santa Barbara that was designed for commuting. So, he traveled back and forth to Santa Barbara to attend classes while also keeping up his massage practice. 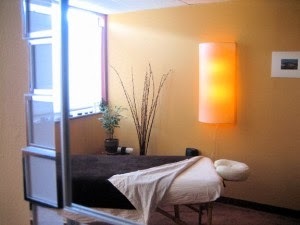 The Energy of Massage: Peter currently practices massage and provides counseling services, and he likes the mix. He enjoys being a massage therapist. It’s fun, and lets him use his talents and gifts. Peter says the practice is always different, and he enjoys creating the experience for each client, from the music he plays to the incense he burns during the session. He enjoys being part of something that is so inherent to health and vitality. Additionally, massage therapy is physical, hard work. So, it forces him to keep a healthy lifestyle and to stay in shape. Portland! : Peter is also completely at home in Portland. He feels like he has come full circle. It was at ski camp in Mt. Hood where he started the journey that led him to massage and Qigong. And, he couldn’t be happier to be here. He loves the people and culture of Portland. He believes it’s a place where people are proud to be doing their own thing, their own way. A place where people value living the life they believe in, and not sacrificing it all to make as much money as possible. It’s a community with diverse personalities and philosophies, which makes it a rich community. You can learn more about Peter and the services he offers at www.petergoldmassage.com. He is located at 407 NE 12th Avenue, Suite 207, Portland, Oregon. The phone number is 503-806-9680.